In a fashion, dramatically different that the one from last year, the US version of the Samsung Galaxy S III has arrived on the market. There is no waiting, measured in months like in the case of the smartphone's predecessor. This time, Samsung made sure that its flagship will arrive to the most lucrative market in a timely manner. The above event however is hardly the most important thing about the newly launched smartphone. It's the handset's design and, to be more specific, the lack of any changes to it, compared to the I9300 which impresses the most. For the first time ever, Samsung's Android flagship has arrived to the Land of the Free sans any cosmetic changes for all US carriers - a big deal any way you look at it. The visuals of the US Galaxy S III might have remained unchanged, but the smartphone's internals have gone through a serious makeover. Gone is the Exynos chipset with quad-core CPU and Mali 400 GPU. 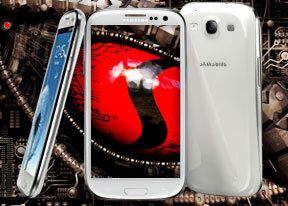 In order to play nice with the 4G networks stateside, the Samsung Galaxy S III has received Qualcomm Snapdragon S4 silicon with two Krait CPU cores, clocked at 1.5GHz. In order to ease up the pain over the lost duo of CPU cores, the Yankee Galaxy S III has twice as much RAM, compared to its global sibling. As you can see above, the US Galaxy S III ticks every box an Android power user can imagine. The smartphone is simply loaded with talents - both in terms of hardware and software. For those of you, who are in a hurry to bash the dual-core CPU of the handset, we suggest you wait until after we walk you through its benchmark scores. Chances are that your fears are unfounded. We have already put Qualcomm's latest silicon through its paces, and found it to be quite zippy. Besides, 2 gigs of RAM and LTE or 42Mbps HSDPA connectivity are not exactly a bad tradeoff. Design is entirely a matter a personal taste. We can attest however, that the smartphone will easily grow on you over a serously short period of time. As you have probably guessed by now, the hype surrounding the US bound Samsung Galaxy S III is huge. So are the expectations. Continue reading to find out if the handset lives up to both. As always, we'll begin with an unboxing, followed by a design and build quality inspection. Editorial: The Samsung Galaxy S III is available in a number of carrier versions in the US. There's one for AT&T (SGH-I747), one for T-Mobile (SGH-T999), one for Sprint (SPH-L710), another one for Verizon (SCH-I535) and another one for U.S. Cellular (SCH-R530). We had the AT&T and the Sprint versions for testing. You should rest assured that hardware- and software-wise all the carrier versions are the same so the findings in this product review apply to them all. You also might notice that this review doesn't include all of our proprietary tests. The reason is it has been prepared and written in the States, far away from our office and test lab. Still, we think we've captured the essence of the phone in the same precise, informative and detailed way that's become our trademark. Enjoy the good read!